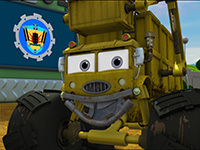 Monster Truck Adventures is a Dove-approved animated series featuring Meteor and his friends in the town of Crushington Park. Meteor, LT, Junkboy, Ponytail and the others roar over jumps and splash through the gunk, while learning scripture-based lessons in responsibility, obedience, humility, forgiveness, and much more. Great for kids ages 4 to 9! Fans of the series Meteor and the Mighty Monster Trucks will find Monster Truck Adventures familiar, with one key difference: we wrap up every episode with a special Bible-centered character lesson and a verse from scripture. We think this make a good show into a great show! Want to tell us what you think of the show? It is simply brilliant to take a truck, present it with a talking character, to teach a Bible lesson. I wish there were more DVDs like this one out there. I have really fallen in love with this series and its bright and colorful animation. Each episode not only features a fantastic character lesson, but they also tackle everyday issues that little kids struggle with like making new friends, jealousy, pride, obedience, and more. I can honestly say that this series is well written and wonderfully illustrated. The monster truck characters are adorable and each has a vibrant personality. Also, the Biblical themes were evident and clearly stated, yet they didn't "thump you over the head or anything." If you have a son or daughter, or any child in your life, who likes Lightning McQueen and Cars, I highly suggest Monster Truck Adventures. Even better because, like my little guy said, these trucks "love Jesus"!